Preheat oven to gas mark 5/190. Fry the chicken pieces in a little oil with the courgettes for up to 5 minutes until brown all over. Cook pasta for 2 minutes. Drain. Add the Passata and 100ml water to the chicken and courgettes in the pan, stir then bring to boil. 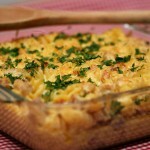 Creamy chicken bake 4 out of 5 based on 1 ratings. yum looks delicious! Can’t wait to try it. Thanks Claire!